“Because looks do count”, that was the basic idea when MechaTronix started to develop their next platform of spot light, down light and shop light coolers… Inspiration for the design was searched in natural elements which express the feeling of cool or cold. 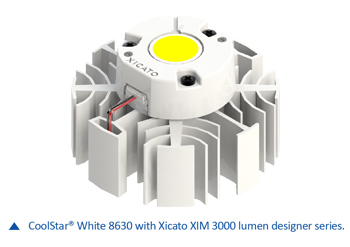 The CoolStar® family covers the whole range of cooling capacity from 1000 lumen all the way up to 6000 lumen, what positions them as well in the spot light developments as in the down light and shop light luminaires. The modularity in LED engines which can be mounted either directly or with a LED holder (ref. BJB, TE Connectivity, Bender Wirth) is respected on each design. On top of that some practical features have been added, like two closed wire pockets at the sides which allow to guide the wiring from the LED engine to the back side outside the visible field. Besides the black anodized versions which are commonly used, MechaTronix has also opted this time for a “pure white” electro-plating as an option, underlining the high-end looks and blending with the mostly white looks of both the LED engines and the LED holders. The CoolStar® LED coolers will be presented at the Light + Building show in Frankfurt Germany, while global stock is under production to launch by end of February. MechaTronix is globally represented in 61 countries through 87 specialized distributors and has central warehouses in Taiwan, Hong Kong and The Netherlands.